Monday was a bitter-sweet day at the 2018 World Series of Poker. A true legend of the game announced his retirement, before making a very exciting deep run in one of the coveted Championship events, proving he’s still up there among the best. Meanwhile, two new bracelets were awarded, and the Millionaire Maker and THE MARATHON saw massive days completed. Here’s all you need to know from Monday (June 11). Some breaking news was making waves around the halls of the Rio on Monday morning: the Godfather of poker, ten-time bracelet winner Doyle Brunson, announced his retirement. After 62 years as a professional player, Brunson has managed to stay at the top of the high stakes poker world. Throughout that time, he always had his wife Louise by his side, having met in 1959 and tying the knot in 1962. But if the time has come for one of the all-time greats – the man who literally wrote the book on poker with Super System – to hang up his gloves, then he’s going down swinging. Only 11 players remain in Event #23: $10,000 No-Limit 2-7 Lowball Draw Championship, and Brunson is still in the hunt from the 95-strong field, coming into Day 3 fifth in chips. This event got 95 entries, and Brunson didn’t even enter until the beginning of Day 2. He was joined by his son Todd, and across the course of action the father and son duo found themselves at the same table, even sat side-by-side. Todd Brunson will also return tomorrow seeking his second bracelet. It’s two-time bracelet winner Mike Wattel who holds a massive chip lead though. As the only player with more than a million in chips, Wattel has twice as big a stack as his next opponent, Shawn Sheikhan. Three-time bracelet winners Brian Rast and Farzad Bonyadi are still in the hunt, as is four-time bracelet winner John Hennigan and single bracelet winner Ray Dehkharghani. Sheikan, Dario Sammartino, and short-stacked James Alexander are all hoping to catch their first WSOP gold. Action resumes at 2pm on Tuesday, with all players guaranteed $18,955. There’s $259,670 up top for the winner though. 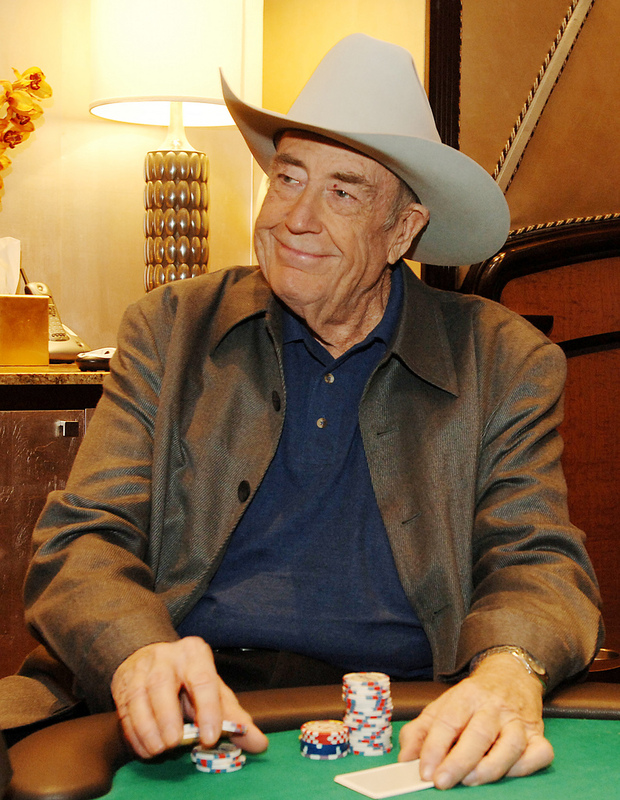 Can Doyle Brunson bookmark his extraordinary career with an eleventh bracelet? 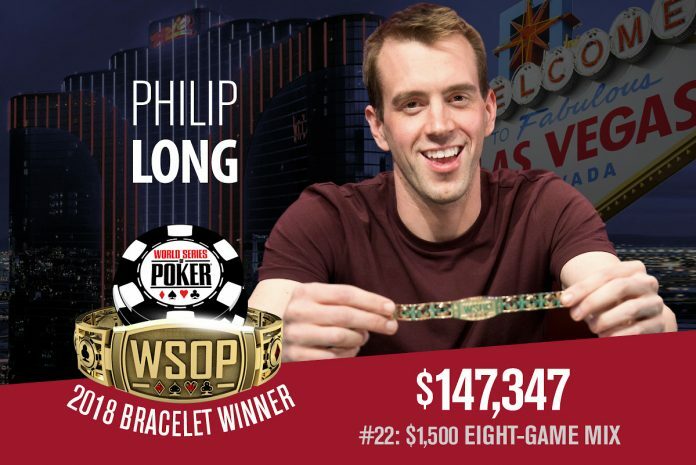 The UK’s Philip Long took down his first WSOP bracelet on Monday, defeating a tough final table after three days of play across eight different games. Long would ultimately defeat Kevin Malis heads-up to bank $147,348 and the bracelet, but it was three-handed play that really grabbed the attention of the Las Vegas crowds. Six-time bracelet winner Daniel Negreanu went out in third place after he got it in during a NLHE round with two pair only to run into Malis’ flopped set. John Racener, Per Hildebrand, and Nicholas Derke rounded out the final six, finishing in 4th, 5th and 6th respectively. There were 16 players who returned for the third and final day, with the likes of David Bach (16th), Robert Williamson III (14th), Anthony Zinno (13th), and Mike Matusow (12th) going deep but failing to reach the final table. 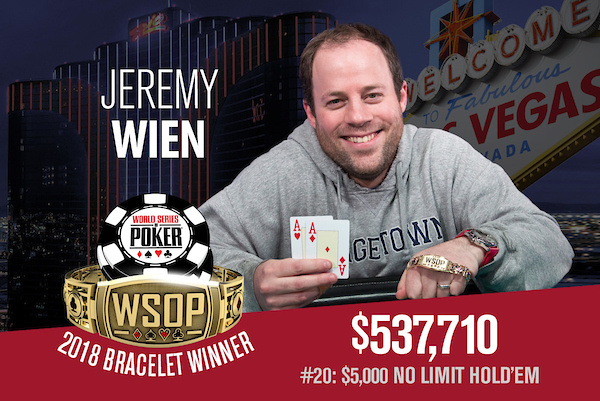 The second bracelet of the day came in Event #20: $5,000 No-Limit Hold’em, which saw first-time bracelet winner Jeremy Wien overcome a 4:1 chip disadvantage to defeat Spanish pro David Laka heads-up for the massive $537,710 first-place prize. The 138-hand duel took up almost half of the entire final day action, a day which saw some of poker’s elite talent gathered around one table. Jake Schindler, Shawn Buchanan, and David Peters all made this final table, outlasting the vast majority of the 518 player field. Laka dominated this finale, eliminating Peters, Buchanan, and Schindler, the latter of which went out in brutal fashion. Schindler was all-in with pocket kings against Laka’s ace-king, and an ace on the river sealed his fate. But when Laka met Wien heads-up, the American managed to grind a comeback. The final hand saw both reach a jack-high flop before an all-in and a call. Wien held pocket aces versus Laka’s pocket queens, and that was all she wrote. What’s even more impressive is that Wien isn’t a pro. The derivatives trader from New York didn’t even pack enough clothes to make it through the tournament, but when he started to go deep he made a change of plans. One of the most popular events of the entire WSOP is Event #21: $1,500 Millionaire Maker; you only have to look at the size of the field to know that. After two starting flights, only 1,104 of the 7,361 total field returned for Monday’s Day 2. Now, ten 60-minute levels later, just 155 remain, and they’re all chasing the chip lead of Aaron Messmer. He bagged up 1.089 million, and is most closely followed by Clyde Shimp (978,000) and Manig Loeser (914,000). There are plenty of other notable names still in contention. Former Main Event champs Joe McKeehen (487,000) and Greg Merson (295,000) will both return for Day 3, as will JC Tran (387,000), Joseph Cheong (459,000), and the red hot Elio Fox (348,000), seeking his second bracelet of the summer. Throughout the day we lost the likes of Jack Sinclair, Martin Jacobson, Chris Moorman, Taylor Paur, Jared Jaffee, Tuan Le and Daniel Strelitz, all of whom made the cash. Everyone is now guaranteed $7,697, but there’s a whopping $1,173,223 up top for the victor. A total of 1,479 runners took their shot today in the slow-paced Event #24: $2,620 THE MARATHON No-Limit Hold’em, and after six 100-minute levels 706 players remain. However, registration will remain open until the end of Level 8 on Tuesday (around 3:30pm). It’s Joshua Smith who had the best day of all, bagging up a day-topping stack worth 234,800. He’s followed by Pablo Fernandez (230,900), Sanjay Dulabh (230,200), and Walter Rodriguez (224,300). The likes of Olivier Busquets (148,000), Ben Heath (142,500),Scotty Nguyen (133,000), Gaelle Baumann (131,600), Faraz Jaka (119,000), Andre Akkari (68,500), Martin Jacobson (63,200), Jesse Sylvia (53,700), Kristen Bicknell (51,400), Cate Hall (47,900), Dzmitry Urbanovich (47,100), and Cliff Josephy (42,600) will all be back in action tomorrow. The other event which kicked off with a Day 1 on Monday was Event #25: $1,500 Stud Hi-Lo. This one attracted 596 runners, and after ten levels that field was chopped down to 174 players who will advance to tomorrow’s Day 2. While it’s Trent Gundrum who earned the right to be overnight chip leader with his 72,000 stack, the headline belongs to Eli Elezra who finished the night in third (71,500). Elezra came close to grabbing his fourth bracelet earlier in the series when he finished runner-up to Paul Volpe in the $10,000 Omaha Hi-Lo Championship. Some of the big names who fell today included Chris Vitch, Phil Hellmuth, Phil Ivey, Daniel Negreanu, Benny Glaser, Chris Ferguson and Justin Bonomo, while others who found a bag include Max Hoffman(78,700), Nick Kost (49,600), Matt Savage (46,700), John Holley (38,900), Brian Hastings (37,400) and Frankie O’Dell (37,000).